Karachi: The Pakistan Super League launches its third edition in Dubai on Thursday, adding a sixth team, more international stars and with hopes that the Twenty20 tournament can be staged entirely on home soil from 2019. The new Multan Sultans and the confirmation of a slew of international greats such as Shane Watson and Brendon McCullum (right) has given a lift to fans eager to forget last-year's spot-fixing scandal. And the decision to stage the three final matches of the PSL at home, in Lahore and Karachi, could pave the way for the entire tournament to be staged in Pakistan next year. The Sultans, bought by the Schon Group for $5.2 million (Dh19 million) - twice the price tag of the previous most expensive team in the franchise, the Karachi Kings - are coached by legendary Pakistani paceman Wasim Akram and skippered by Shoaib Malik (right). They will take on defending champions Peshawar Zalmi in the opening match in Dubai on Thursday, after a rousing opening ceremony set to include a performance by US rapper Jason Derulo. Pakistan has staged its international fixtures in the UAE in recent years as it grapples with militant violence. But a dramatic improvement in security saw officials stage the PSL final in Lahore last year, its biggest match in nearly a decade, a move which boosted hopes the cricket-obsessed country could become an international venue once more. This year two of the three play-offs are planned for Lahore, with the final due at the National Stadium in Karachi on March 25. Pakistan Cricket Board (PCB) chairman Najam Sethi (right) said he hopes that in 2019 the entire tournament will be played at home. "That will pave the way for a full series in Pakistan by a top team," Sethi told AFP, speaking from Dubai ahead of the tournament. "We are very satisfied that PSL has become an international brand in two years." Busy schedules mean top foreign players such as England's Eoin Morgan, Alex Hales and Jason Roy are only available for part of the tournament as are Bangladesh's Tamim Iqbal, Shakib Al Hasan and Mahmuddullah Riyadh. But the presence of stars such as Australia's Shane Watson (right) and Chris Lynn, the West Indies' Sunil Narine, Andre Russell, Samuel Badree, Dwayne Bravo and Kieron Pollard, and New Zealand's McCullum and Luke Ronchi will lift interest. Wasim stressed that officials are also eager to seek new talent from Pakistan. "We found Shadab Khan, Fakhar Zaman and Hasan Ali from the first two editions of the PSL so the main aim is to hone the talent of local players," he told AFP. One of the most exciting new players on show will be lanky fast bowler Salman Irshad, who is set to become the first player from Pakistan-administered Kashmir. Another fast bowler, Shaheen Shah Afridi, and batsman Sahibzada Farhan - both from troubled areas of northwestern Khyber Pakhtunkhwa province - will also be on the radar. Along with early teething problems, the league was rocked by a spot-fixing scandal last year which ended in five-year bans on Islamabad United openers Sharjeel Khan and Khalid Latif. "We are working with the Anti-Corruption and Safety Unit of the International Cricket Council to make sure that strong measures are in place to stop fixing," said Sethi. Also on a trial will be Karachi, the sprawling, chaotic port megacity set to host the final. 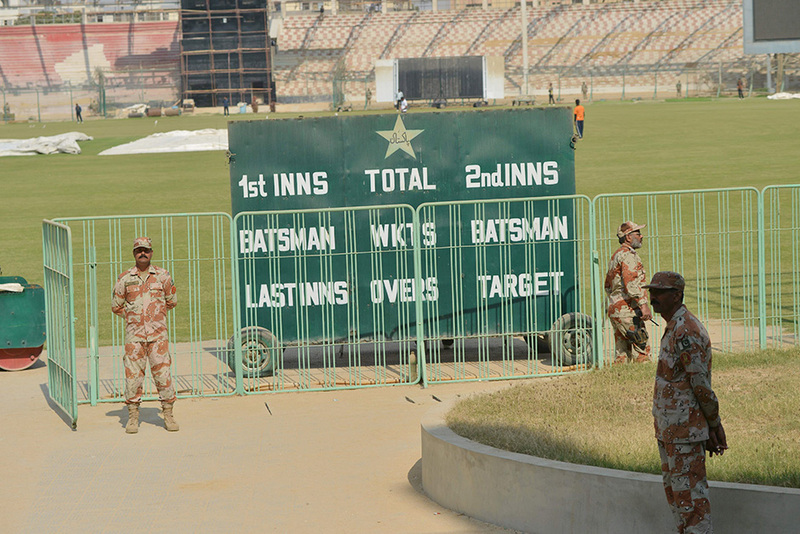 With normality returning after decades of ethnic violence, Karachi is rolling out head-of-state level security to stage its first high profile match in nine years. The last international fixture played at the National Stadium was between Pakistan and Sri Lanka in February 2009, just one week before a fateful match in Lahore, where militants attacked the Sri Lankan team bus. The assault left eight people killed and seven visiting players injured, and became the incident which drove international cricket from the country. But four Twenty20 internationals - three against a World XI comprising of players from seven countries, and one against Sri Lanka - held following the PSL final last year have helped restore confidence.